FLOYD MAYWEATHER TO FIGHT IN SOUTH AFRICA THIS SUMMER? Is undefeated pound-for-pound champion Floyd Mayweather planning a return to the ring this summer? According to his uncle, Jeff Mayweather, that's a strong possibility. "I've been talking to Floyd and there is a possibility of a fight, but I don't know yet," revealed world-class trainer Jeff Mayweather during a recent conversation with FightHype.com. Apparently, Mayweather has been in talks with Zindzi Mandela, the daughter of former South African president Nelson Mandela, about the possibility of staging a fight this July in conjunction with Mandela's 93rd birthday. "I know that he is talking to Nelson Mandela's daughter because they are trying to put together something for his 93rd Birthday. He [Mandela] is a big fan of boxing and a big fan of the Mayweathers and he wants something to be a part of his birthday celebration and things like that. Of course, in the midst of that, they're also trying to make the fight between Floyd and Manny," Jeff Mayweather explained, making it clear that a fight with Manny Pacquiao is still a top priority despite the fact that Floyd could return to the ring this summer against a different opponent. "Right now, I'm kind of just talking to them and they are working to basically get a letter of intent for the fight to possibly take place. But of course we gotta talk numbers and things like that for anything to happen. 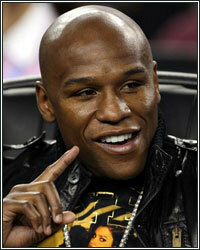 I gotta talk to Lil Floyd to see what he is looking to get," Mayweather continued. It's not clear as to what role Jeff serves in regards to Team Mayweather, however, with talks of a letter of intent, it sounds as though he is indeed fielding offers for the services of Floyd. Whether or not a summer fight actually takes place remains to be seen, however, given that Floyd last fought ten months ago, it would be wise to take a tune-up before stepping into the ring with Manny Pacquiao for the most anticipated fight in boxing history.